Since its inception, people have devoted countless hours and made many sacrifices to assist Goldens in need. 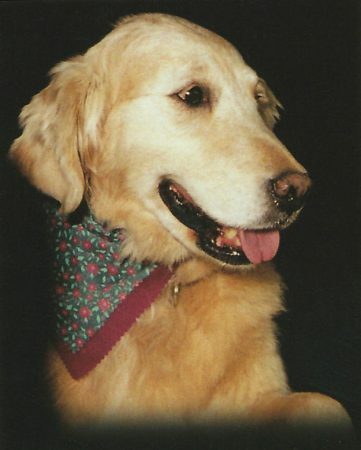 GR was organized November 1990 by Golden Retriever breeders, Penny & Rob Manning. The following is Penny’s unedited and personal account of GR’s birth. In the spring of 1990, a man drove by our home and spotted me training two of our Goldens on the front lawn. He pulled up and told me he was on his way to the animal shelter to drop off Cyrus, a gangly 10-month-old Golden purchased on impulse as a six-week-old puppy. Cyrus had not lived up to his owner’s expectations of the breed ~ he was destructive and unruly ~ the exact opposite of the perfect family dog that the vendor promised. And so, Cyrus had to go. Conversation with the owner revealed that Cyrus was spending more than 12 hours crated every day, had no training, and no one could manage him on leash so he was rarely exercised. It was also apparent he had never seen a brush, nail clippers or a bathtub. During this conversation, Cyrus was stretched out of the car rear window as far as he could without toppling. He intently watched us…grinning and wagging his tail so hard that his entire body was swinging back and forth. He seemed to be a happy, goofy adolescent puppy who needed direction in his life, lots of exercise, and a bath or two. Since I knew at that time the municipal shelter only held adoptive pets for a limited time before euthanizing or sending animals to research facilities and, since I thought no one would likely want this dirty, wild pup, I made a decision to ask if I could take him. The owner immediately handed me his short chain leash and drove away as quickly as he could before I changed my mind. I simply had no idea what I was going to do with Cyrus and Rob was slightly surprised to see we had a new guest in the backyard. After some discussion, we decided to clean up and tame this little beast and find him a good home. Even though Cyrus was not a well-bred Golden, had been sold too young, and had been isolated and ignored, he did have a true Golden temperament, high intelligence, and a desire to please. We taught him basic commands ~ how to walk with a leash and behave in the house and we spent hours doing puppy socialization. The transformation was remarkable ~ bathed and groomed, he looked like a completely different dog. His desire to learn and be with people was so strong that he blossomed into a willing and self-confident young Golden. It was not difficult to find a family for Cyrus but he needed a family experienced with dogs who could continue to give him what he most wanted…people and the opportunity to learn new tasks. We found him a new family and it was a very successful adoption. Since Goldens were such a popular breed, I began to wonder what was happening to dogs like Cyrus who were in inappropriate homes. After a few calls to animal rescue groups in the GTA, it became abundantly clear that purebred dogs were no strangers to animal shelters. I was shocked to hear the stories of how many Goldens ended up in pounds and thought they surely must have been dogs that vaguely resembled Goldens…not ‘real’ Goldens. I was proven wrong within the month when I received a call from an animal rescue organization telling me there was a Golden Retriever in the shelter who had been hit by a car and was due to be euthanized that day. The staff were willing to release her to me only if I took her directly to a vet for diagnosis and treatment if possible ~ euthanized if not. My sister Sue and I headed off to the trailer shelter in the woods and were directed to a beautiful reddish Golden female who had been hit on the highway, left in a ditch for who knows how long, and when discovered, brought to the shelter by town workers. She was undoubtedly a Golden…about four years old and although not in apparent distress, she could not stand. She had urinated and defecated on herself, but otherwise appeared well-kept. Despite a weakly wagging tail, she greeted us with a sweet disposition. We decided to see what could be done for her and at the very least give her a dignified ending. Sue and I made a stretcher from an old blanket, carried her to the car, and with all windows down to keep the smell at bay, took her to the office of fellow Golden breeder and vet, Dr. Cindy Tran. Fully expecting to hear a poor diagnosis with a humane euthanasia as the outcome, we were happily surprised when x-rays revealed a fractured pelvis, which would bridge together and heal on its own in a few weeks if she could have crate rest. The thought of keeping a crated, incontinent dog in our small home was overwhelming. Then Cindy slung a towel under the Golden’s belly by the rear legs and lifted her rear end off the ground allowing her to walk using her front legs. The dog showed she could relieve herself outside. So the sweet dark Golden, who would become Lucy, came to our home to recuperate. Again, Rob was surprised to find a new house guest, but quickly fell in love with this beautiful gentle soul who quietly rested in her crate for long hours without a fuss. She adapted to sling walking for short bathroom trips and gratefully accepted attention. As she slowly began bearing weight on her hind, we thought she would have a high level of disability, so we decided she would stay with us permanently. However, after months of increasing mobility, Lucy displayed only minor lameness. As she adored visiting children, we felt she deserved a family of her own and our neighbours, who thought she was the greatest dog ever, asked if they could adopt her. For the next eight years, until she died of old age, we had the pleasure of watching Lucy thrive in her family…complete with her own two human children. After our success with Lucy, we began to receive calls from rescue organizations. One had a Golden, Sasha, a beautiful blonde about 10 years old. She was relinquished by her owners because she had simply become too old. The shelter staff had little hope for adoption as she had joint stiffness and diarrhea (which turned out to be giardia…an easily cured protozoan disease). Otherwise she was active and happy with an outstanding Golden temperament. We soon learned that finding homes for elderly dogs was a challenge. Fortunately, my recently retired parents agreed to keep her and she became their constant, healthy, beloved companion until she passed away. At first, we expected that all Goldens in need of a home would be poorly bred, puppy-mill dogs with uncaring owners…and unfortunately, we had our fair share of those. But well-bred and well-loved dogs were also in dire need of new homes. An owner’s divorce, death or serious illness could result in a shelter drop-off. Dogs with illegible tattoos found running loose by animal control and unclaimed by owners were very vulnerable unless quickly adopted. It became abundantly clear that there were a number of Goldens desperately in need of good homes and we were running out of family, neighbours, and friends who could adopt a dog. So, in order to continue rescuing and placing dogs, we needed help with financing, veterinary care, picking up dogs from shelters, rehabilitation, training, and re-homing. We had an overwhelming show of generosity from so many Golden breeders and owners when we reached out and told them about our small rescue and placement effort. From vets, who would waive or reduce fees, to breeders who would tuck donations into my hand at dog shows, to dedicated Golden owners who volunteered to help in any way possible, there was a passion to help Goldens in need. But there were hard questions that had to be answered. How do we keep the organization functioning as a safety net for Goldens and not a dumping ground for unwanted puppy mill dogs? Would we take dogs from owners as well as shelters? How would we find homes for the elderly and special needs dogs? How could we raise enough money to care for Goldens in need and how would we deal with the steadily increasing demand for the rescue of our breed? These and other difficult issues were tackled through meetings of a volunteer Board of Directors comprised of breeders and owners who brought canine and other professional expertise to the table. Early members were Rob, Sue, and I, as well as Carol Lee, Sharon Viersen, Liz Russell, Don and Bev Rintoul, Don and Anna Morison, Molly Barber, Anthea Arsenault-Sharkey, Eileen Ansell, and Tony and Michelle Rebelo. Committees to handle finances, policies and procedures, publicity, and fundraising were formed and we gradually became a functioning, non-profit organization working on behalf of Golden Retrievers in the GTA. In time, many adopting owners also became active in the organization, supporting our cause by bringing dogs to specialty shows, meeting up at picnics and other events, as well as purchasing fundraising Golden-related items. The early years of Golden Rescue were certainly a time of remarkable growth and success as well as challenges and hard-learned lessons ~ all of which became the foundation for the organization to build upon. Rob, Sue, and I are grateful that we had the opportunity to work with such highly committed volunteers who served the Golden Retriever breed so well during those years and wish continued success for the Canadian Golden Retriever Adoption Service Inc…aka Golden Rescue. Initially, board members completed most of the tasks within Golden Rescue, such as the intake, fostering, and adoption process. With each new intake came an understanding of what was required of the organization and so began the development of various functions and committees, thus creating the foundation for Golden Rescue into the future. The winter of 1993 brought the publication of the first quarterly newsletter The Guardian. The newsletter kept our adopters, volunteers, and supporters informed about the organization and upcoming events. It included stories and photos of our rescued Goldens plus informative articles about the care of our canine companions. Issue #12, published in 1996, reported that the mailing list was over 390 supporters and through the years that number has continued to grow. During the 1990s, Golden Rescue attended about 20 venues per year (i.e. Royal Winter Fair, Pet Expo, and the Credit Valley Dog Show). Initially, it was just a table with a few items for sale plus information about the organization. Over time, demand created the need for a logo, which was imprinted on a variety of merchandise. Through such exposure, the volunteer base began to grow significantly, which in turn also meant Golden Rescue grew, thereby helping more Goldens in need. Since the early years, Golden Rescue has hosted an annual picnic and the tradition continues today. This brings together the volunteers and adopters with their Goldens. It has always been a fun day filled with games for the dogs and opportunities to renew friendships ~ both human and canine. From the date of inception to the end of 1992, 20 Goldens had come into the program. From November 1990 to December 31, 1999, 176 Goldens had found their forever families. In 1999, the name Canadian Golden Retriever Adoption Service Inc. was officially registered as a corporation. Looking to the future, the name was registered federally, thus allowing expansion across Canada, if and when appropriate. Nora came to Golden Rescue in 1993 having endured her five or six years of life in a horrid puppy mill. Her feet were badly ‘splayed’ (flat and open like ducks webbed feet) indicative of living in a wire crate. She had virtually no muscle tone in her legs, which made it difficult for her to walk until her muscles gained enough strength to carry her weight. She was so shut-down that her rehabilitation started by duplicating her past environment ~ in a crate, in the dark, and in a garage. Slowly, by small steps, she was introduced to normal family life in a home. The haunted look in her eyes diminished over time as she demonstrated her tremendous will to live. She tried hard to adjust to normal family life, but sometimes the obstacles seemed insurmountable. Observing her pure joy when she succeeded in overcoming her fears was all the incentive needed to continue with her rehabilitation. Nora aged gracefully and with all the dignity that Goldens seem to possess. She was happiest on the couch, snoring loudly and safely deep in sleep. Her incredible Golden spirit remained intact throughout her years of neglect and abuse, rising to the surface when she encountered love, kindness, and understanding from her foster mother, who soon became her adoptive family. Nora became Golden Rescue’s ambassador attending many media functions and fundraising events and for many years. She even inspired the next logo. The new millennium dawned with the launch of a website. In 2002, the website became interactive with membership and adoption applications available online. Keeping abreast with rapidly changing technology, the website became our primary marketing tool. This was a decade of growth, building, and expanding ~ both the geographical area and volume of the volunteer base, plus increasing public awareness of the organization. The mission statement, which succinctly summed up the purpose of Golden Rescue, was created: The Canadian Golden Retriever Adoption Service Inc. is a volunteer-operated, not-for-profit charitable organization dedicated to rescuing and re-homing displaced Golden Retrievers and to educating the public in general about pet ownership. We carefully screen all incoming Goldens for socially acceptable behaviour and approve those whom we feel we can responsibly place. We provide spay/neuter service, micro-chipping, and all the necessary veterinary care required to place them in their forever homes. 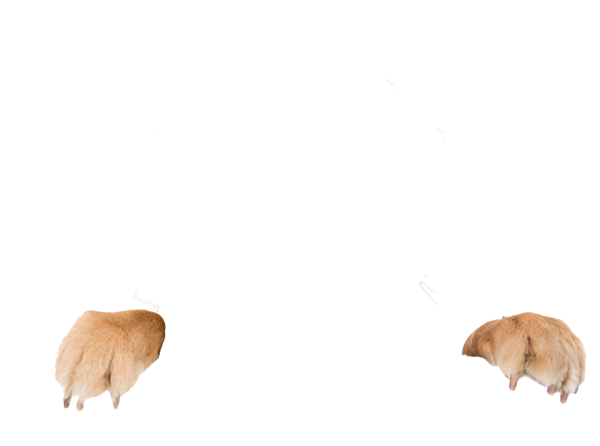 We provide public education by means of brochures, an informative and entertaining newsletter, public/media appearances, and canine educational events, which focus on responsible pet ownership and in particular, the Golden Retriever breed. 2001 was a memorable year as Golden Rescue received its charitable status. This helped immensely with fundraising. Achieving charitable status allowed us to create a solid program with supporting vets. Dr. Joanne Best from Oakville Mississauga Vet was the first to offer a discount and the first to come on board as a supporting vet. Golden Rescue could not operate without such assistance from numerous veterinary clinics. The website lists all our supporting vets ~ see ‘Friends of Golden Rescue’. Every year the average cost per dog increases as Golden Rescue accepts the Goldens in need of surgery and medical attention while in foster care. In the year 2000, 41 Goldens came through our program. 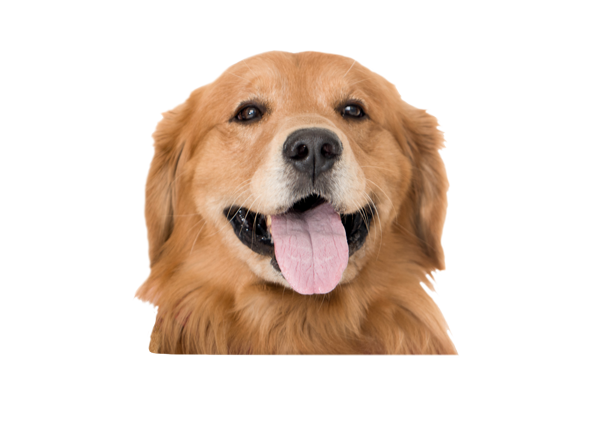 By 2008, approximately 200 Goldens annually needed our help. It became obvious that GR had to develop new ways to fundraise to keep up with the increasing demand. GR’s first major fundraiser was a Wine & Food Pairing at the Varley Art Gallery, where nearly $10,000 was raised. The first golf tournament in June of 2002, held at Parkview Golf Club, was supported by 80 golfers and raised $7,800 ~ a monumental achievement. Each year the participation grew to a full field of 144 golfers as Golden Rescue secured tournaments at private courses. After two years of diligent work, in 2003 the name ‘Golden Rescue’ was trademarked, which was so much easier for every day usage and advertising. In no time, people recognized The Canadian Golden Retriever Adoption Service Inc. simply as Golden Rescue™. In 2003, we purchased a display wall for the general store/booth, featuring photos of our rescued Goldens. This, along with the prominent yellow canopy tents, made Golden Rescue very visible at shows and an attraction for canine lovers. Although we sold Golden related items or clothing with our logo as a means of fundraising, it was also a forum to educate the public about canine ownership and to promote the organization. In 2004, the first calendar was printed featuring photographs of our rescued Goldens along with their stories. Golden Rescue calendars are still being produced, which is a great way to fundraise and highlight the beautiful Goldens that come into our program. A very generous donation from avid supporters and adopters in 2006 put Golden Rescue on the map. Their gift of a truck painted with five foot Goldens and the organization details on the sides and back, became a traveling billboard. The truck also stands out proudly when parked at venues or driving in parades. You can always find Golden Rescue, either by the yellow tents or the truck. In the first 15 years since our inception, we rescued 500 Goldens. In the next 10 years, we rescued over 1,600 Goldens, so it was obvious that phenomenal growth plans needed to continue for the organization to adapt, through our structure and our fundraising efforts. Many of the amazing volunteers who were responsible for the initial creation and stewardship of the organization had retired and many new volunteers were required. By 2010, there was effectively a new Board of Directors comprising of relatively new volunteers whose main job was to restructure the organization to meet rising demands and to find ways to adapt the processes so as not to exhaust volunteers, as was starting to happen during those amazing growth years. At the same time, the average cost per dog had risen to $1,700 so the organization has had to consistently raise $350,000 to $400,000 annually to ensure that all Goldens in need would get the second chance they so deserved. To effect these changes, many new volunteers were required and recruited. The Board of Directors created new teams with team leads for literally every function (i.e. intakes, placements, fostering, transport, fundraising, advocacy, social media, website administration, data, events, team resources, volunteer coordination, treasury, marketing, communications, advertising…to name a few). Our ‘village’ of volunteers continues to grow and this continues to be one of our primary goals. Advice from a fundraising professional strongly suggested that our number one goal for fundraising is to grow our monthly donor base so an aggressive campaign ensued and monthly donors have and continue to rise. We have also started to put emphasis on Planned Giving. The Board of Directors grew from six to 12 as Golden Rescue has grown to be Canada’s largest single-breed rescue organization. During this current decade, our newsletter, the Guardian, began production in colour. It has blossomed to a 16-24-page full-colour newsletter whose subscribers have consistently grown. A new logo was created with two tag lines ~ ‘About Second Chances’ and ‘Heal.Foster.Adopt.’ Notice that the shadow of the Golden is really a hand…a helping hand. The website was completely revamped. Because of our online presence, adoption applications were flowing in ~ approximately 2,000 per year. Fundraising efforts have also adapted. The golf tournament had run its course and attendance was decreasing and profits were evaporating so this was replaced with the Wishbone Lottery which is our current major fundraiser. The lottery, along with a number of fundraising initiatives such as LCBO Tag Days, has given Golden Rescue a healthy balance sheet year over year. The annual picnic continues to grow. In 2014, there were over 800 attendees with 364 dogs, mostly Goldens. We know the exact number of dogs because we broke two Guinness World Records: the most number of dogs wearing bandanas (previous record was 200) the largest dog grooming lesson (previous record was 339). The GR mailing list of supporters/well-wishers has exploded to over 7,000 and our communications team send out regular eblasts about adoptions, events, and fundraising. The adoption alerts are popular as they are written from our Goldens’ perspective. Our social media teams have built and continue to build a vibrant Facebook group, a solid Twitter following, and regular posts on Reddit, Pinterest, and Instagram. In 2015, Golden Rescue celebrated our 25th anniversary with the publication of the 400-page coffee table book ‘Golden Reflections’ telling stories of 25 years of rescued Goldens. Our borders have expanded as well. We are now firmly in Quebec with a growing number of fosters and volunteers and we are slowly making in-roads into other provinces but this growth is totally dependent on finding fosters, supporting veterinaries, and other volunteers. Our volunteers also strongly believe that rescue has no borders so we have started to rescue Goldens internationally with our ‘Rescue Mission of Love’. Rescue groups from other countries have contacted us to help some of their Goldens in need. Although the vast majority of Goldens have been coming from Istanbul, we have also rescued Goldens from Egypt, Mexico, and Shanghai. To date, we have rescued and successfully rehomed over 250 Goldens from abroad. publicity from the media including television, radio, newspapers, magazines and on-line. All of this gives rescue increasing exposure and is helping us reach our eventual goal of a national presence. As of March 2019, we have rescued over 3053 Goldens who have needed us for their second chance and our passionate and dedicated volunteers will continue to help as many Goldens in the future as possible.